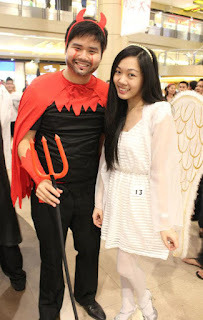 How was my 1st Halloween at SM City Cebu? Fangtastic reason # 1: Trick or Treat for the kids! Cute! Check out that Hulk costume. If I was a mom, I'd drag my kid and go to war for candy in this crazy crowd too! Fangtastic reason # 2: Dress up your cubicle contest. And even though our ghost party town didn't win, still proud of the showcase of artistic talents. Fangtastic reason # 3: Costume contest! What halloween would be complete w/o the costumes? Spot: A vampire, kampanyerang kuba, Uncle Fester. And the winner is.. hands down..
Engr. Bernard Fario in his costume titled, "Made in Taiwan."